Honolulu's May Nielsen ratings show an evolution of competition in the local news business. KGMB-TV's "Sunrise" morning news show claimed No. 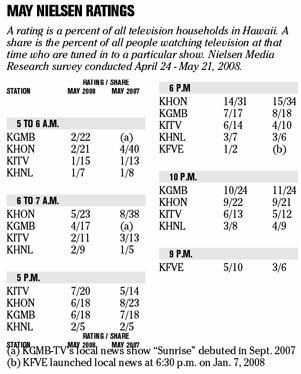 1 status from 5 to 6 a.m., while long-dominant KHON-TV is No. 1 after 6 a.m. and stays strong through 8 a.m., "where the core (morning news) audience is," said Joe McNamara, president and general manager. Rick Blangiardi, president and general manager of KGMB, noted a "huge shift in viewing behaviors," in a market not known for sudden changes in local news viewing habits. He was warned by industry friends not to expect salable ratings for "Sunrise" for a year, he said. However, in the November Nielsens six weeks after its September launch, "Sunrise" registered a 1 rating and 14 share at 5 a.m., topping other stations' shows. It has expanded to a 4:30 a.m. start time and is a solid No. 2 from 6 to 7 a.m.
"From being out of the game completely to getting in the game after eight months, it feels very good," Blangiardi said. "We are clearly in pursuit of the news leadership in the morning." Newscasts by KGMB and KHON, formerly sister stations, are tied for No. 2 at 5 p.m., when KITV took the No. 1 slot, up from third place last May. That, despite longtime anchor Ron Mizutani's return to KHON in April. "Our 5, 6 and 10 o'clock news shows really good growth from a year ago," said Mike Rosenberg, president and general manager. KHON anchor Joe Moore maintains his No. 1 position at 6 p.m., with numbers being encroached upon by weekend anchor Marisa Yamane. "Joe Moore better watch out," joked McNamara. KGMB, meanwhile, held its lead at 10 p.m. The ratings for KHNL-TV news are "frustrating" for John Fink, vice president and general manager, as it recently won a regional Emmy award for overall news excellence. "It's frustrating to be acknowledged for offering a different, fast-paced, relevant and interesting newscast and not see an immediate result," he said. KHNL's 11 a.m. newscast doesn't show up in the ratings yet, but Fink expects to see growth as more people become aware of it. The newscast is also streamed live online. KHNL sister-station KFVE-TV offers news at nontraditional times. The 6:30 p.m. news garnered a small rating but its 9 p.m. news has grown and surpasses KHNL at 10 p.m.
Station-commissioned studies revealed that there is no common viewership, "so we know that when we combine the newscasts we're doing a pretty good number," Fink said.